DECORATIVE ART: Naked Cherubs Fresco, Rare Art Unearthed in Nero-era Mansion by Rome. Mosaics, colored stucco and cherubs sporting on sky-blue background found in house that had been occupied for hundreds of years (Philippe Bohstrom, Haaretz). 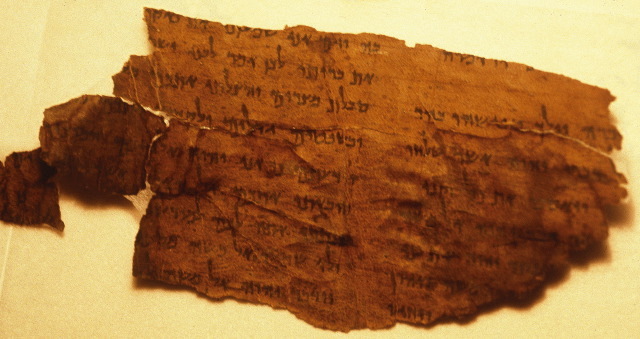 This site is of considerable interest in itself, but it doesn't have a direct connection with ancient Judaism. I draw attention to it because the terminology is a little confusing. 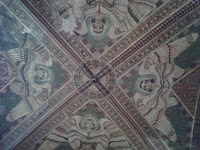 The "cherub" fresco shows slightly chubby children with wings. I would call them "cupids", not "cherubs." 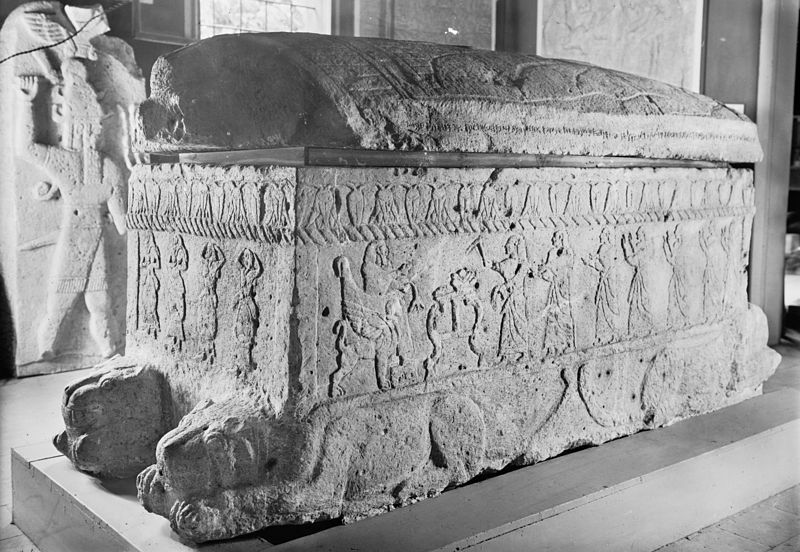 A cherub throne is depicted on the front right corner of the Phoenician Ahiram sarcophagus (Wikimedia Commons). Cf. 1 Kings 10:18-20. Ezekiel's cherubs mix in a lot of Babylonian iconography and some visionary wildness, but are based on that template. In Jewish and Christian mysticism, four cherubs form the base of God's throne. 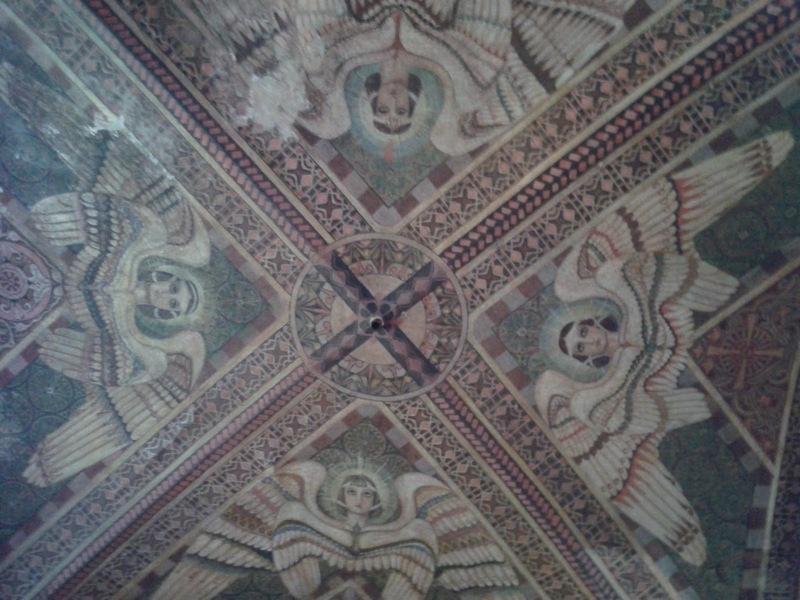 Art Deco cherubs of Ezekiel in the Church of the Hermitage of Camaldoli, Italy (J. R. Davila). A "cupid" is a Greco-Roman representation of the mythological figure of Cupid from the myth of the love story of Cupid and Psyche. But it represents him in that chubby child mode. In later Christian tradition, the cupid iconography was associated with the term cherub. According to Philologos, this chubby child tradition came from a misunderstanding of a comment in the Talmud. It still lives today in the image of winged baby Cupid shooting people in their hearts with his arrow to make them fall in love. 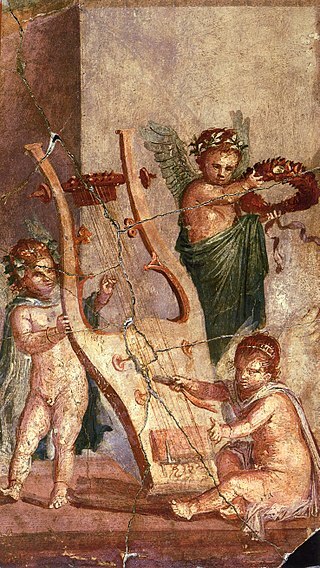 I see nothing about this Roman site that connects it to ancient Judaism, so it would be clearer to call the figures in that fresco "cupids" rather than, anachronistically, "cherubs." That is my understanding, but I am not an art historian. If I've gotten something wrong above, I would be grateful if any readers who are real art historians would correct me. Anyway, this is an interesting site and an interesting article.